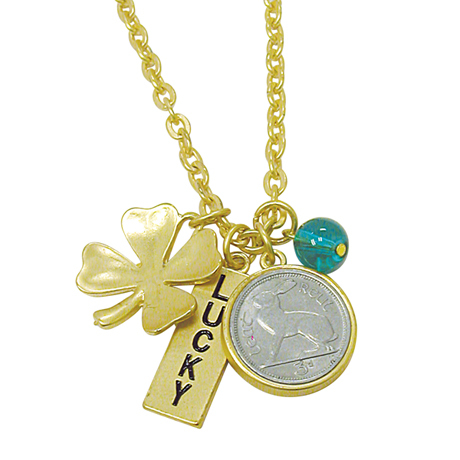 Luck knows no boundaries with this Rabbit Coin and Charm Pendant. Feel lucky all day wearing our goldtone lucky charm pendant, charms include a 3 pence Irish coin, a four leaf clover, a Lucky tag and a green ball. The 3 pence copper nickel clad Irish coin is wrapped in a goldtone bezel and hangs from a 24" goldtone chain with a 3" extension and a lobster claw clasp. According to Irish folklore the four leaves on the clover represent hope, faith, love and luck, while the color green represents "good people." A Certificate of Authenticity is included. Allow 1-2 weeks for delivery. Item can only be shipped within the Continental US.